An ambrotype showing the portrait of an old woman seated in a studio setting. The woman wears a black dress with a full skirt and long sleeves. The dress has a lace collar and cuffs. She also wears a bonnet that ties under the chin. The woman rests her hands on arms of the chair she is seated in. The ambrotype has been tinted, with the material on the back and arms of the chair in red. 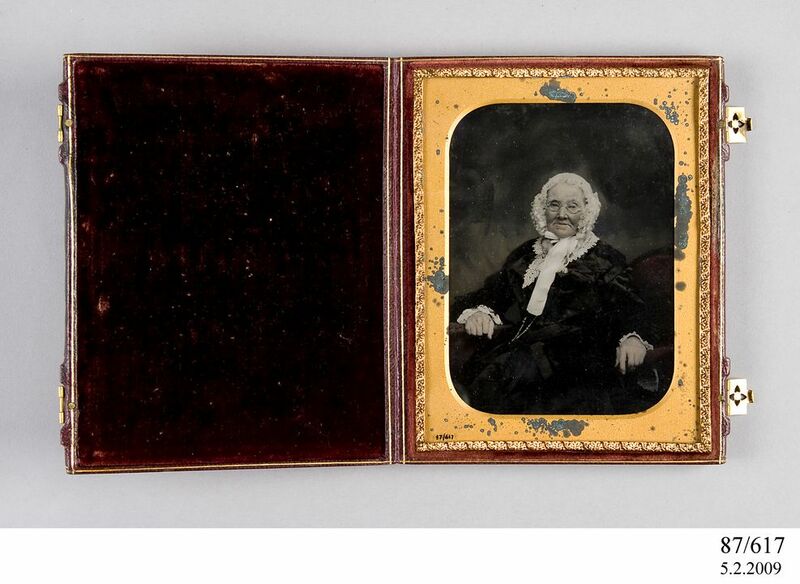 The ambrotype is enclosed in a hinged case made from wood that has been covered in leather. The case opens to reveal the ambrotype on the right hand side. The ambrotype is framed in a rectangular brass mat. A glass panel sits over the top of the brass mat and another decorative brass frame sits around the outside of the glass. The opposite side of the case is lined with faded red velvet. On the outside of the case, the leather features an embossed decorative pattern. Two metal clasps on the side of the case allow it to be closed securely. In 1851 Frederick Scott Archer announced the discovery of a new photographic process that could adhere to glass. This was a major breakthrough in the story of photography for the process made clear highly detailed negatives form which multiple copies could be made. The general public had become used to their photographic portraits being taken using a daguerreotype process which were displayed in a small glass fronted case. To compete with this trade a special kind of collodion process, known as the ambrotype was introduced. This was essentially the same as other collodion negatives except that once the exposure had been taken the emulsion on the glass was bleached to whiten it. When this bleached negative was placed in a case against a black background it formed a positive image which bore a remarkable resemblance to the daguerreotype except it had the added advantage of not being highly reflective. Australia followed rather than set photographic trends but in the 1850s, the massive boom caused by the discovery of gold ensured it was very quick to take up new processes like the ambrotype. Over the 1850s the ambrotype replaced the daguerreotype as the preferred method of taking portraits but even in the late 1850s daguerreotypes were still being made for more conservative customers. The subject of the ambrotype, Mary Hyde was baptised on 19 February 1779 at Halesowen, Worcestershire. She married Simeon Lord after the birth of their fifth child at St Phillip's Church, Sydney on 27 October 1814.